Cleared all Quests in Story mode. "You kept clearing Quests even after being the final boss? Well, go you!" Watched all events. "It's great that you saw everything, but, um... That means you saw EVERYTHING we did?! Uh-oh." All characters won the Gamindustri Gauntlet at least once. "This gauntlet thing was one heck of a tournament! Seems we're all winners, so let's go and make Gamindustri peaceful again!" All characters cleared Neptral Tower. "We all made it! I expected an upside-down Neptral Tower at the top, but hey!" Defeated Next-Gen Mech at the top of Neptral Tower at Level 1. "You seriously did this with base-level stats? You're so good that being weak doesn't even matter! Did you cheat? No...?" Raised the Lily Rank of all characters to MAX. "We're all so buddy-buddy that we just hug and giggle instead of argue anymore. And that lovely image is all thanks to you!" Cleared Chapter 3 in Story mode. "We introduce our special guest...uh, wait, since when did we have a special guest?!" Won the Gamindustri Gauntlet for the first time. "Like, almost every entrant was a CPU or a CPU Candidate, so... No wonder nobody else wanted to try except for that goofy dogoo. Use the prize wisely!" Cleared Neptral Tower for the first time. "Did you see that view?! I was like 'wow, what a view' and stuff! I bet if everyone made it up there, it'd be a viewtacular extravagander or whatever!" Raised a character's level to 99. "The cap is 99 this time. I mean, c'mon, you can whomp n' stomp anything now." Collected all accessories. "Good going on hoarding trinkets! They all have neat effects, so use them properly." Acquired all medal bonuses. "As the king, I appreciate you giving me these medals. Er, well, that's from a game. I understand the desire to collect them all. Really, I do." You started a new game! "Pretty awesome to get a trophy for starting the game! Make sure you mention it in reviews, Gamindustri journalists!" You started a new game! "This is a nice treat for the little sister fans out there. Root for our little'uns, 'cuz they're the future and all that jazz." Cleared Chapter 2 in Story mode. "Forgot to do some Quests? It's okay, my completionist buddy. You can take care of them whenever. Those pesky newsies will appreciate it!" Cleared a Quest with HDD mode active. "You're a natural at this transforming thing! But, uh, you won't force us to keep HDD active forever, right? It's so tiring..."
Triggered Costume Break during a Quest. "Do we get stronger the more skin we show? Even if it helps us complete Quests, none of us really want to stay like this for long. CPUs have feelings too, y'know!" Watched a CPU go about her daily duties. "Peeping Tom! Just kidding. We've got a lot to show, so be sure to stop by and join in the fun!" Performed a sound test. "Yo, yo, yo. We've got so much music, your head's gonna spin like a record. Take a gander with your ears!" Uncovered Irregular Quest conditions. "This was originally a programming glitch, so maybe it should've been removed. Huh? Oh, sorry, I'm told that's taking breaking the 4th wall TOO far." Cleared a Quest while wearing an accessory with negative effects. "That was kinda tough. Did you ever think about taking on the strongest enemy in the game at Level 1? Or putting on a CPU Chastity Be--ow! Ow...ow, just...ow." Learned a Lily Special. "A special combo attack using two friendly folks! Everyone got a dance partner?" Used EXE Drive. "This is still a pretty broken feature, even in this action game. It can be used outside of HDD as well, so use it as your personal WIN button!" Dealt 999,000 damage in a combo. "Yikes! Nice numbers you got there, pal. Nothing can survive that blast of digits!" Performed a 999-hit combo. "Pretty skillful use of button mashing! I bet you had to make sure the enemies wouldn't all turn to mincement first, didn't ya?" Defeated 999 enemies in a single Quest. "Whoa, someone's got some pent-up rage. Where did you even FIND that many monsters?" Used all characters in Quests. "Who's your fave? It's cool, I won't get jealous if you don't say me. I say that because I know you'll say me anyway. I just wanted to play it cool." Selected the two Gamindustri journalists for a Quest. "I had no idea they were such forces to be reckoned with! Well, guess this gives me time to play some games...er...time to...uh...catch up on work." Selected Neptune and Nepgear for a Quest. "C'mon, Nep Jr.! We're both the main characters today!" Selected Noire and Uni for a Quest. "One acts contrary, and the other acts contrary about the contrary comment! At least they seem to enjoy saying what they don't mean to each other." Selected Blanc and either Rom or Ram for a Quest. "You can only pick two in this game, so I bet one of those kidlets cried over this. Blanc sure is lucky to have two kids who love her that much!" Selected Vert and Nepgear for a Quest. "This joke again?! WHYYYYY?! Why do they get a trophy, developers?! Vert's getting way too attached to Nep Jr., so...please, just give her a little sister." 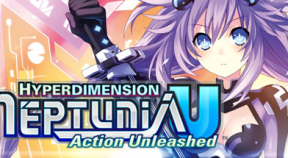 You did everything you could do in Hyperdimension Neptunia U: Action Unleashed! "Congrats, completionists! Maybe I'll see you in a canonical game soon!"